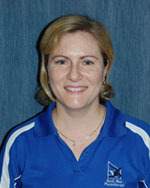 Lisa is a part-time receptionist at North West Physiotherapy. Lisa joined the team in 2011 and with her background in office administration, she can assist you with any enquiries you may have and appointments you need. In co-operation with the Physiotherapists, Lisa is only too happy to be of assistance to you. Lisa enjoys spending time with her family, going to the movies and loves getting to the beach & jet skiing.